Learn how you can benefit most from aerobic training. Cardiovascular exercises aren’t limited to jogging on a treadmill or working on a stationary bike. You can get the health benefits from this type of training with any physical activity that includes constant or frequent movement. Gradually build up to 30-45 minutes per day of moderate to vigorous exercise and you’ll achieve the level of fitness proven to reduce health risks substantially. Pick your favorite activities, and make sure they will fit into your lifestyle. 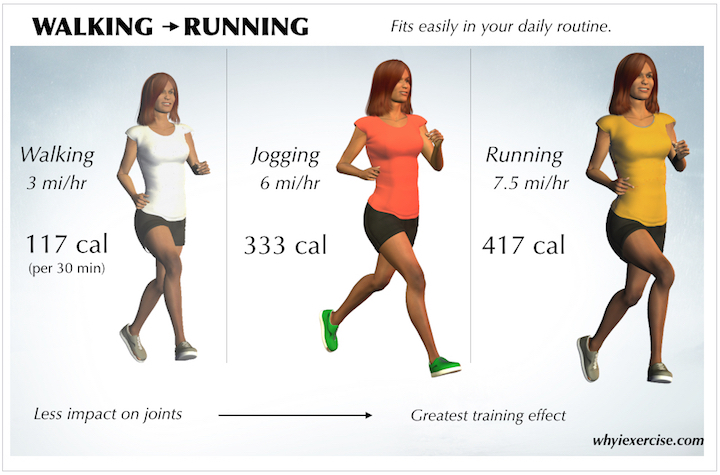 Check out some of your best options and compare the calorie burn in the diagrams below. Note: Calories were calculated for a 150 pound male. 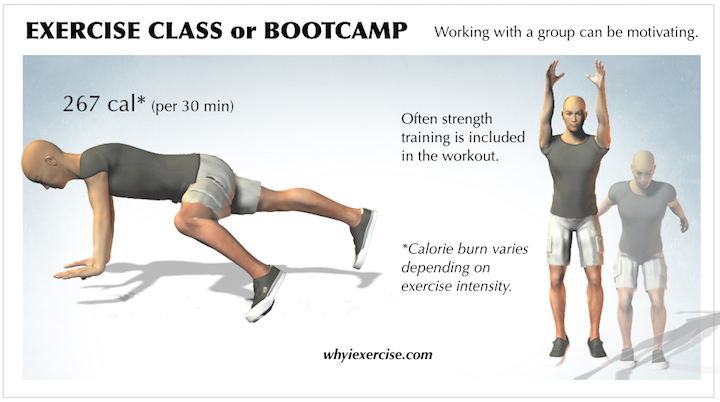 To see more detailed calorie info, see my article on calories burned during exercise. Walking is a great starting point for the convenience alone. Try a walk in your neighborhood at home or work. Maybe there’s a nice park in your area on the commute home. Work your way up to a brisk pace and include hills for greater calorie burn and better health benefits. When pressed for time, you can of course park further away from the shopping center to fit in some exercise while you’re out. To improve your fitness, add 2-3 minutes per week to your walk time. Find a hilly route to get your heart rate up. Interval training is helpful as well. For 1 minute out of every 5 minutes of your walk, pick up your pace to a very fast walk. A great way to introduce jogging into your training is in one minute intervals. Once you can walk briskly for 30 minutes, try picking up the pace to a jog every 7-10 minutes during your walk. New running shoes that match your foot type and a soft, flat running surface like a school track or park will help ease your transition to jogging. My article on high intensity interval training will give you more ideas for picking up the pace during your workout. Though not as convenient and inexpensive as jogging, biking and swimming are excellent alternative cardiovascular exercises. 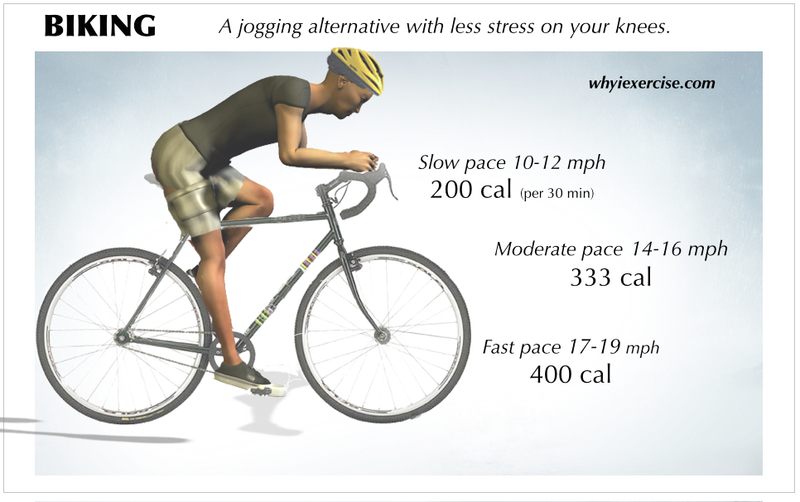 Biking is generally less stressful on your knees than running. To ensure that this will be the case, set the seat height so that your knee is slightly bent (30 degrees) at the bottom of your pedal stroke. Since biking and running will emphasize different muscles, it’s a good idea to include both in your weekly routine if you have a bike available. If you enjoy swimming and haven’t been in the pool, you’re missing a great total body workout with little to no impact on your joints. Switch between the strokes you know to work your chest, back and shoulder muscles. As with the walking / jogging progression, start slow (and with a reasonable distance for your conditioning). Also, the better your shoulder flexibility, the easier it will be to include swimming in your workout routine. Check out my article about shoulder stretching exercises to help improve the flexibility of your upper body. Strengthening routines will also give you the benefits of cardiovascular exercises when you use short rest breaks (1 minute or less) between exercises. The key to this method is to alternate between muscle groups so that your muscles don’t fatigue too much as you work to keep your heart rate up. Slow your pace and take longer rest breaks as needed if muscle fatigue is making it too difficult to maintain proper form when you exercise. My article about home exercise programs has a directory with 6 exercise routines you can use for cardio training. For a 30 minute workout, try combining 2 of the routines or going for a brisk walk after you finish 1 strengthening routine. Keep yourself moving with a moderate to vigorous effort, and then sweeping, cleaning, scrubbing and yard work can be a great way to develop your conditioning. Just plan out your work so you can go from one activity to the next without a break, and you’ll get an exercise benefit from your chores. Be safe and pace yourself, especially when using heavy or sharp equipment. If you have children of any age, all types of play can get your heart, lungs and muscles working. Kids love to run, wrestle and to be picked up, and if nothing else, your dog would appreciate a nice walk in the neighborhood. Be sure to pace yourself. Maintain a moderate effort level for best exercise benefits. You can also combine any of the above activities into a workout. For example, if you only have a few minutes of yard work to do, add on a brisk walk, 5 minutes of calisthenics exercises and a set of push ups. 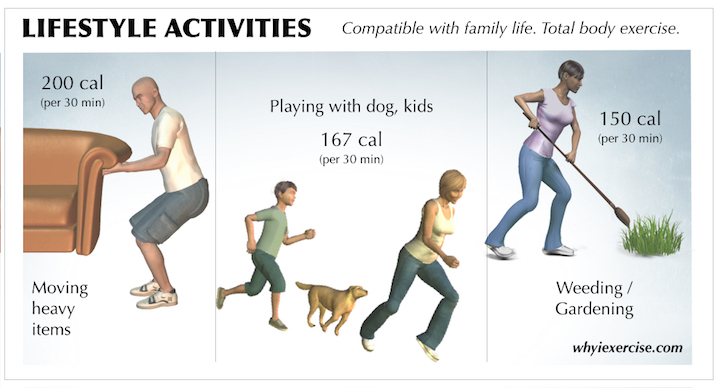 Any combination of activities will work as long as you keep your heart, lungs and muscles working. Return from cardiovascular exercises to free home exercise programs. 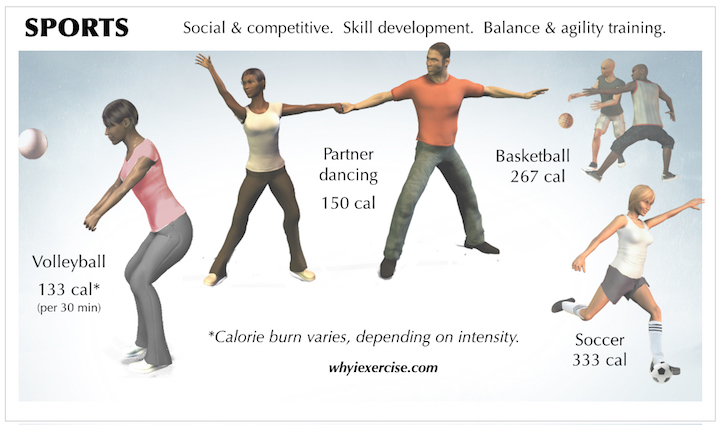 Return from cardiovascular exercises to home page: Why I exercise.